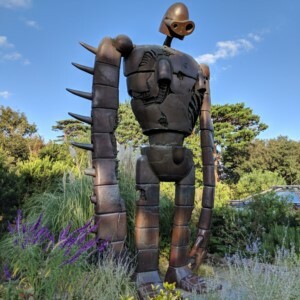 The Studio Ghibli Museum is a museum designed to honor the animated work of Studio Ghibli. Their films include Spirted Away, Grave of the Fireflies, My Neighbor Totoro, and many more. The museum itself is located at the edge of park off the Kichijoji train station (reserved tickets can be purchased via JR line). From the train station, it’s a 15-20 minute walk, depending on fast you walk along the edge of a park. There are plenty of signs directing you to the Ghibli Museum, so you don’t need to worry about getting lost. Just be alert of the many cyclists in Japan that share the sidewalk with you. The museum building is designed so their younger audiences can both have fun, and learn a bit about how animation works. It’s fun because of the numerous shorter decorated entry ways. The entire museum has a playful sense to it with optional shorter archways and curved stairwells to navigate through. There are interactive displays that start and stop so you can be amazed at how the animation works. Finally, there are also hand operated exhibits so kids can really get involved with the animation, which only works if they use the hand crank. For adults, there are also many rooms that feature the original pieces of animated art, both as the original sketch and later fully colored. Some of the animations can be flipped through while others are located on the wall. In this way, you can see how the anime looks at conception versus the final product. Lastly, there is a small theater, and you ticket for admission gives you access to one approximately 15 minute showing. It’s fairly fun, in Japanese without any subtitles. But because of the story simplicity, the point of the story comes to life via the animation. Note that the Studio Ghibli Museum does not allow pictures inside the building. There is a food court and plenty of clean restrooms located inside the museum. Unfortunately, most of the descriptions of art are only displayed in Japanese, so we spent most of our time looking through art, trying to recall the film the artwork belonged. Like most museums, there is also a gift shop where everything Ghibli can be purchased. We ended up buying a few gifts and a Ghibli puzzle for ourselves. From the United States, the tickets had to be purchased in advance through a travel agency and no tickets are sold at the door, but the instructions are clearly written on their website. There were many parents with kids. If you arrive without a ticket, there are only one or two picture points, so you’ll absolutely want to purchase tickets in advance.